American alligators have been in existence for more than 150 million years, rare survivors from the time of the dinosaurs — so it’s fair to say they have this whole “staying alive” thing down pat. 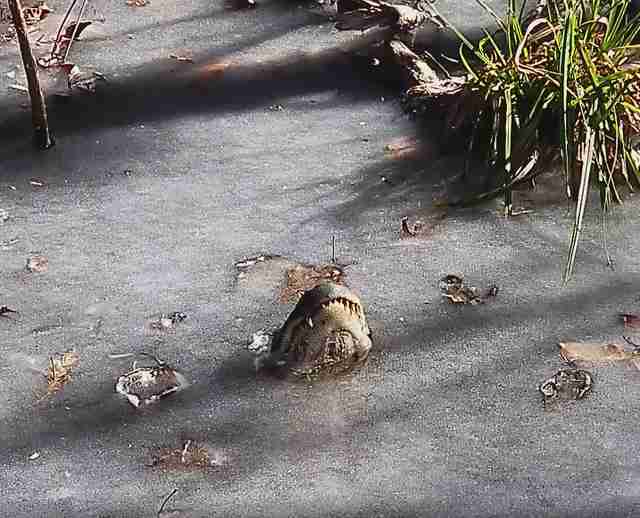 But last week's bomb cyclone, which brought extreme winter weather to much of the East Coast, helped reveal one of alligators' most fascinating survival techniques. North Carolina’s Shallotte River Swamp Park is home to 12 alligators rescued from captivity. As the recent extreme weather system moved through the area, the water they inhabit froze over. So, rather than allow themselves to get trapped under the ice, or risk freezing in the colder air above, the alligators did this instead. They protruded just the tips of their noses through the surface as it iced over, allowing themselves to breathe while remaining mostly submerged. The park’s general manager, George Howard, captured the clever behavior on video, describing the alligators (rightfully) as "survival machines." 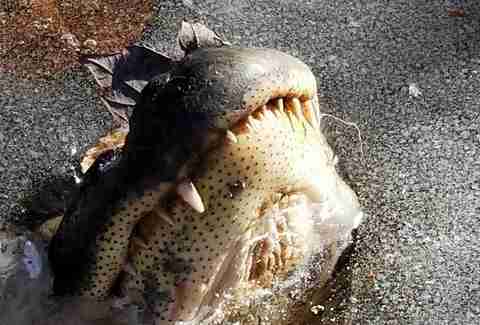 "Adult alligators can survive freezing conditions if they are in water. They submerge their body but keep their nostrils projecting above the water surface, so that when the surface freezes they can still breathe (called the "icing response") ... Yet another example of their amazing ability to survive." Using this technique isn't the only way these creatures cope with the cold. Similar to hibernation in mammals, when temperatures drop, alligators enter into a state of brumation, wherein their metabolism slows as a way of preserving energy. Fortunately, the alligators weren't under ice for too long. On Tuesday, Shallotte River Swamp Park reported that the ice had thawed and the alligators were once again free.